No Man's Land is a term for land that is not occupied often due to fear or uncertainty. It is often land that is being disputed by two countries. 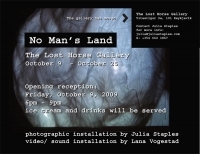 During war it is a term used for the area of land between two enemy trenches that neither side wishes to openly move on or take control of due to fear of being attacked by the enemy in the process.The theme of both artists' work addresses a place of unfamiliarity and transition using installation to create spaces which impose these feelings. The artworks conjure up an emotional sense of No Man's Land as well as a physical description of a place which is not occupied and has an uncertain future. Julia Staples, In and Out, 2008, 26 Archival Ink-Jet Prints 30 x 41 cm each. The subject in Julia Staples' work is the recently abandoned American Nato Base is Keflavik, Iceland. The buildings are large characterless cement blocks--reminiscent of Soviet era buildings. They were designed for non-permanence and now they stand, mostly empty as a reminder of the wars which have come and gone. At one time, the permanence and stability of the relationship between the US and Iceland gave both countries a mutual sense of security. Now the area stands largley empty, slowly being transformed and torn down, as a reminder of a stale relationship.